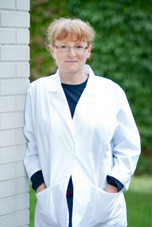 Suzanne is a graduate of the Faculte de Medecine Veterinaire de l’Universite de Montreal. She has been practicing since 1984, joining the Baker Animal Hospital team in 2004. Dedicated to the welfare of animals, Suzanne has also worked as an advisor for the Inspection Department of the Montreal Society for the Prevention of Cruelty to Animals (SPCA), and acted as president of the first Committee for Animal Welfare of the Ordre des médecins vétérinaires du Québec. Through the years, Suzanne has developed a special interest in pain management, as well as animal behaviour. Aiming to reduce the anxiety so often related to medical exams, she tries to make every visit at the Hospital a positive one. Giving all her patients the best of care in a stress-free environment is her commitment to both the animals and their owners. When not working, Suzanne shares her life with her spouse of 23 years and their rescued companion, Chacha the cat.